If you go down to the woods today, you'd better be prepared to laugh and scream your socks off! On the surface, The Cabin in the Woods may appear to look like a cliched and generic horror film, and that's because it's designed to be! It's very hard to say a lot about this film without ruining it and it's twist that you'll have probably heard everybody talking about, but avoid it at all costs because seeing the film unaware will make that much more rewarding. What I will say is that the twist is what makes the film a stand out horror piece, even though it may appear for all intents and purposes to be anything but. The use of such over-cliched generic conventions from the horror genre these days will often make people groan and roll their eyes at the formulaic piece of horror that they'll have undoubtedly seen before a hundred times. What The Cabin in the Woods very cleverly does is takes all of these conventions and cliches from the horror genre and turns them on their head with a unique story that in many ways actually goes on to somewhat justify and explain them. Not only does this well-executed twist make the film a love-letter to the horror genre and a film made for horror fans, but it also makes it incredibly funny, resulting very much so in a horror-comedy that is just as funny as it is scary; a rare feat that I have never seen pulled off as well as it is here. Whilst the cliched horror elements make you laugh at just how cliched they are, they do genuinely provide scares at the same time; and without revealing too much about the secrets behind the twist, I will say that Richard Jenkins and Bradley Whitford steal the show with many of the film's biggest laugh out loud moments in their roles as Sitterson and Holden respectively. Whilst mixing the horror and comedy genres has been attempted many times in the past, it has never been executed quite as well as The Cabin in the Woods has managed to do, with the laughs and thrills coming thick and fast, and often hand in hand. The comedy complements the horror, and the horror complements the comedy - and despite the cleverness of its twist, this is truly what makes the film work as well as it does. 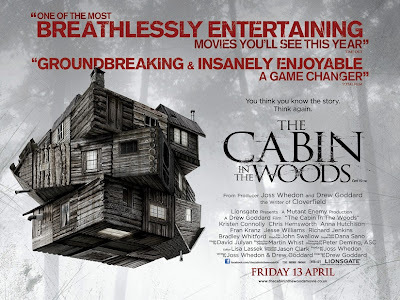 As scary as The Woman in Black; as funny as The Muppets and Jeff, Who Lives at Home; and as much a love-letter to cinema as The Artist; The Cabin in the Woods perfectly balances comedy and humour with it's very clever twist to form a love-letter to the horror genre that packs as many laughs as it does genuine chills. After producing this and directing Marvel's Avengers Assemble, Joss Whedon seems to be the man of the moment - showing some of the other releases of 2012 just how it's done! 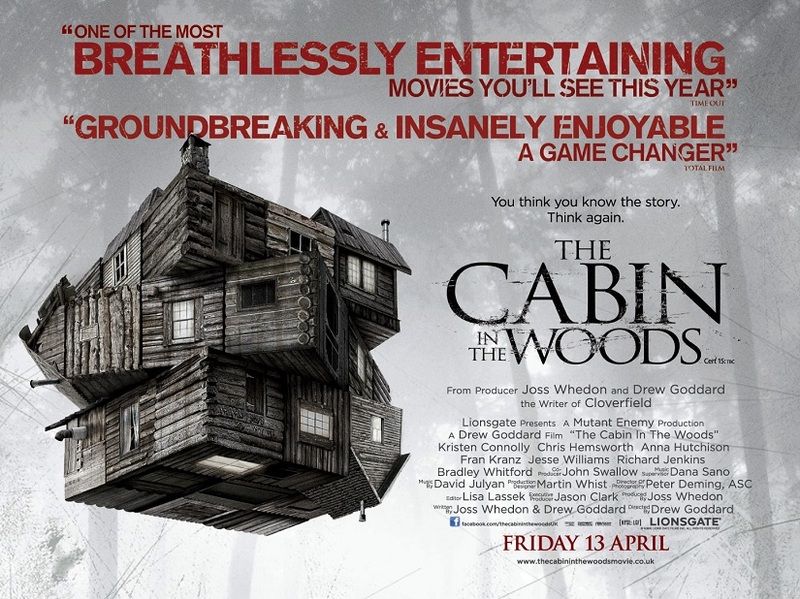 The Cabin in the Woods is still showing in cinemas across the UK. Agree or Disagree? Leave your comments below!